Question: I’m interested in having my personal Bible repaired, but not rebound. What are my options? We are always looking for ways for you to get as much life out of your existing Bible binding as possible. If you send us a Bible to rebind and we think all you need is new hinge cloth or to have the text block tightened, we’ll let you know. But when we feel you would be better off with a new cover, or a change from hardcover to softcover, we’ll let you know that, too. 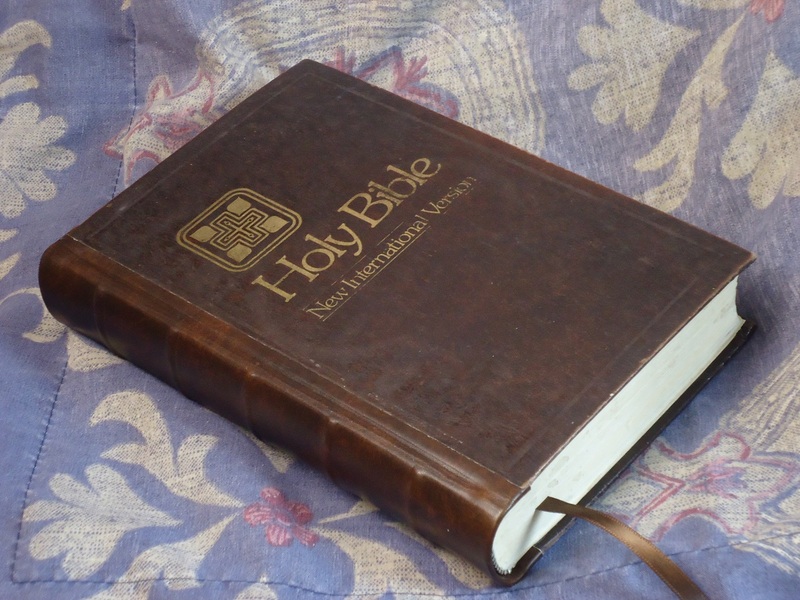 There are several very popular study Bibles on the market today that have serious binding flaws. These are often purchased in hardcover format and are not likely to last more than a couple of years. We have a constant flow of these Bibles coming in. 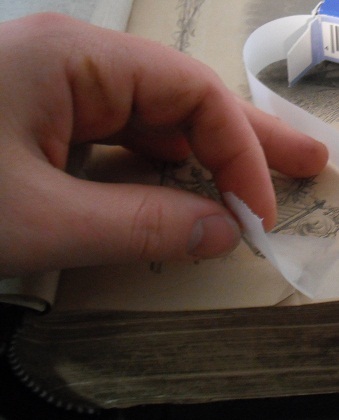 The pages are falling out in chunks because they were bound with a simple glue strip. To remedy this, we can insert glue-soaked cords into the spine and apply new glue and mull (hinge cloth). But these hardcover Bibles can still be a problem. 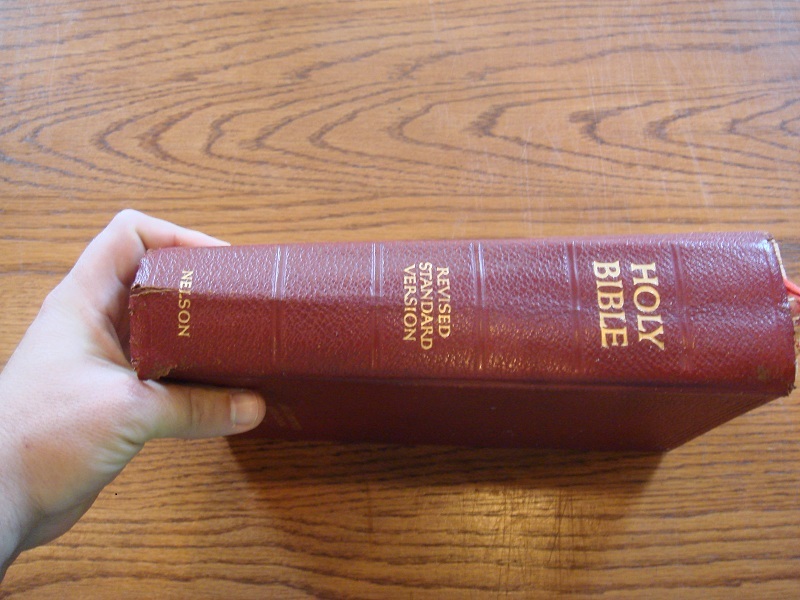 With heavy and wide text blocks and the stiff cardboard covers, unless you have very large hands, these Bibles will flip right out of your hand and come crashing to the floor. A broken Bible is almost a certainty. 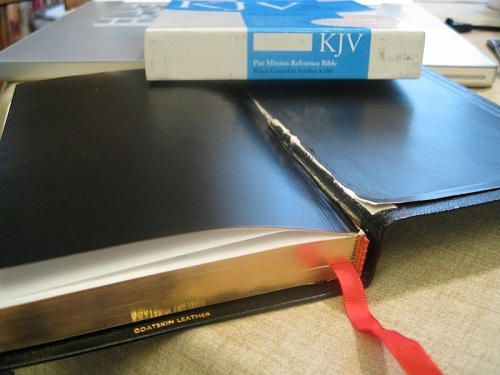 Converting to a leather softcover format is advisable unless you are using the Bible for home study or in the office only. If you have just purchased a Bible and it’s starting to break apart, take it back before you get too attached to it. But if you are already beyond that point, we are here to help you in any way we can, from simple page or hinge repairs, to spine replacements, or to complete restoration and rebinding. We can also rebind your hardcover Bible as a leather hardcover, a much more sturdy option if you’re used to a hardcover format. 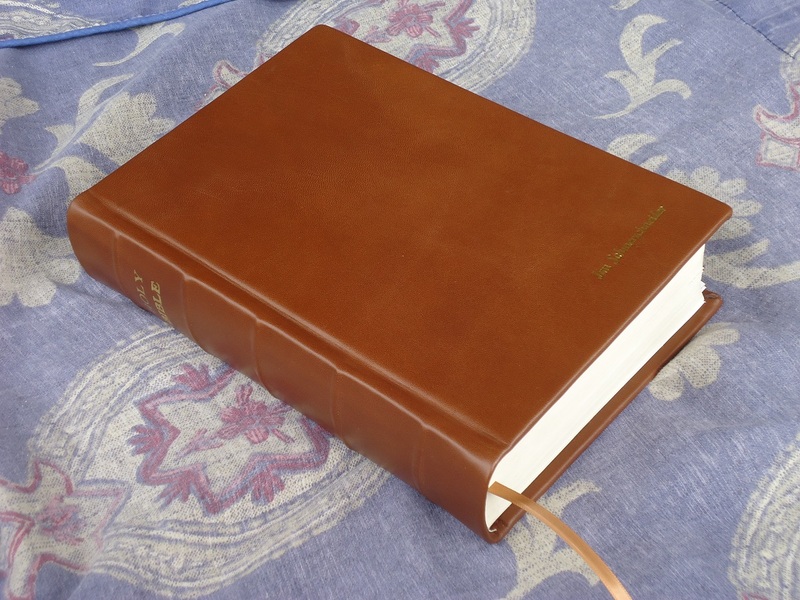 Most of our leathers can be used to make an attractive, durable hard leather cover for your Bible, and the costs are the same as for a softcover. *Cord insertion. This works on glued bindings, and also works on broken sewing. *Re-casing — just putting the book back into the original cover, and tightening up a loose text block. This works as long as the cover is still in one piece, even with bonded leather. But if there’s already much deterioration on a bonded leather cover, we would probably recommend rebinding with a new cover. *Patching a tear in a genuine leather cover. This can be sometimes be done with a bit of leather under the original, but is not recommended for bonded leather. If there is much wear on the cover, we would usually recommend rebinding over patching unless it’s for a keepsake Bible that will not be used much. Once bonded leather has started to deteriorate, it is not restorable. *Removing spine curl (like what a chiropractor does). 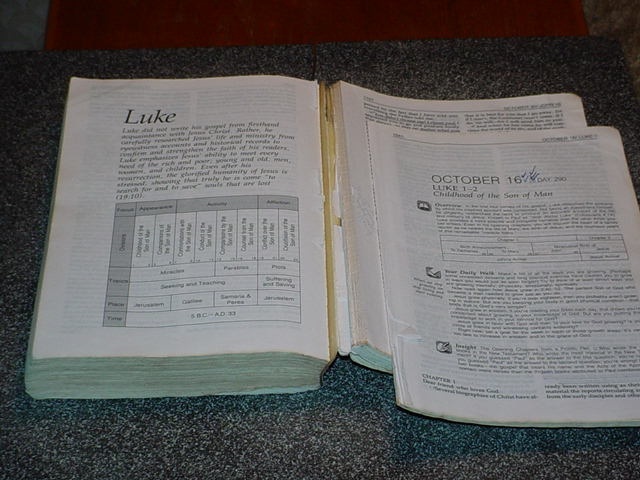 This condition is usually from bending a Bible backwards but also can happen when a Bible has done time in a zippered carrying case. *Adding a graceful curve to a spine — the opposite of the preceding operation. 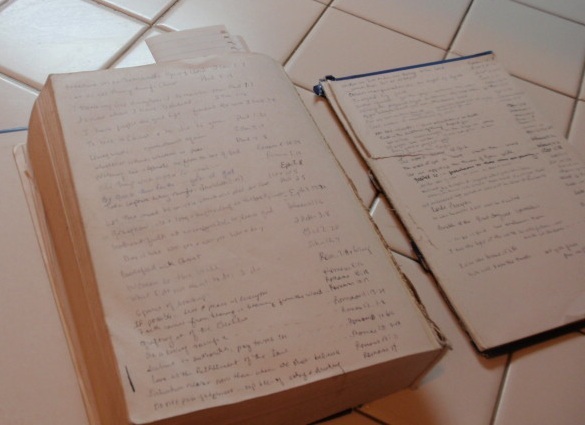 *Page repairs — using acid-free document tape. This also includes putting a new spine edge on a tattered page so it can be reinserted into the text block properly, or remounting an inscription onto a new page. *Reinserting loose pages, removing superfluous pages, or replacing tattered or missing pages with some from another copy of the same Bible. *Inserting additional note pages — up to 4 in the front or the back of the text block. *End page replacement — good, solid, standard leatherette (colored coated paper), with the flexibility and durability you need. *Ribbon marker replacement, head and tail band replacement, and index tab replacement (standard sets only). *Name imprinting — in gold, silver, copper, or blind-stamped (tooling leathers only). 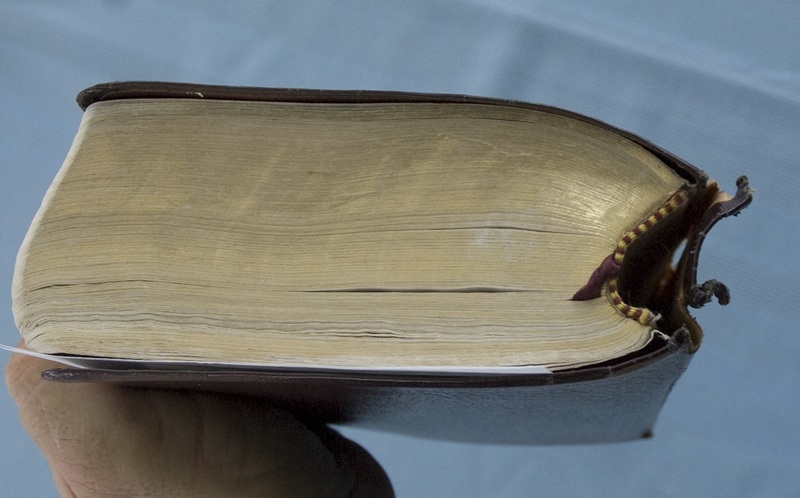 *Re-hinging a cloth hardcover Bible — to reconnect the boards to the spine. 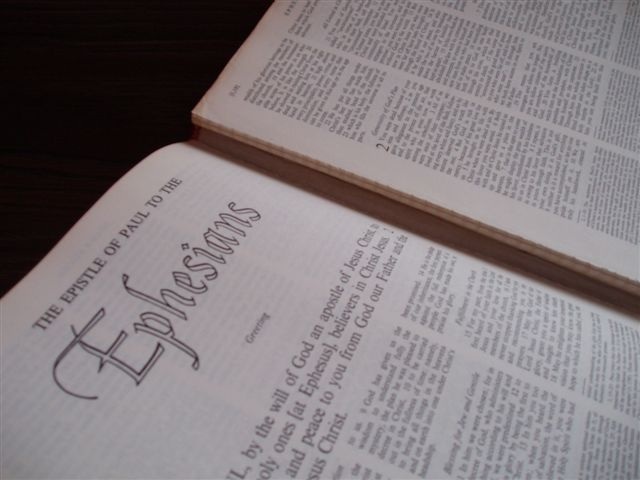 *Replacing a missing spine on a hardcover Bible. *Swapping covers with a different Bible. 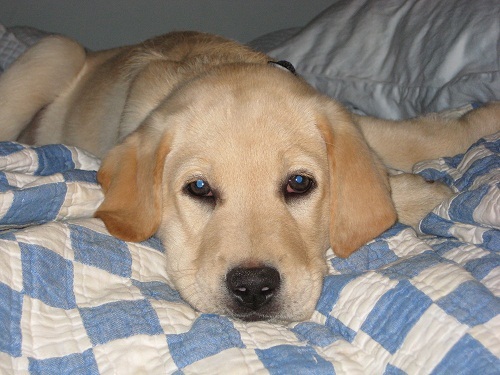 *Repairing dog chews … sometimes. Many of the above items could be done for our minimum repair charge of $20.00 plus return shipping. And in an economy like we have today, that’s a good deal! If you’d like to send your Bible in for a free evaluation, click here for an easy-to-use project form. Or click here for a free quote.